Datuk Ruben Emir Gnanalingam Bin Abdullah has been a Director of Westports Malaysia Sdn Bhd (WMSB) for over 10 years. He attended Victoria Institution between 1989 to 1993 and later, Eton College in UK from 1994 until 1995. 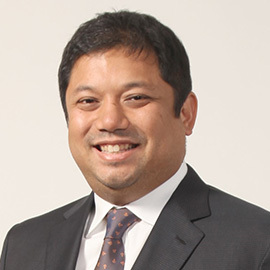 Datuk Ruben graduated with a Bachelor of Science (Honours) Degree in Economics from the London School of Economics and Political Science, UK in 1998. He also holds a diploma in Port Management, awarded by the University of Cambridge Local Examinations Syndicate. Datuk Ruben has attended various Executive Education Programmes under the Harvard Business School, such as the Senior Manager Development Programme and the Leadership Development Programme. Datuk Ruben started his career as a trainee in WMSB in 1999 before leaving WMSB to set up a start-up incubator known as The Makmal Group in 2000 until his departure in mid-2005. He was then appointed to the Board of the Company in July 2005 and was designated an Executive Director in early 2006 before being appointed as the Company’s Chief Executive Officer on 15 January 2009. He is the eldest son of Westports’ Executive Chairman, Tan Sri Gnanalingam a/l Gunanath Lingam. Datuk Ruben is the Co-Chairman of Queens Park Rangers Football Club, which participates in the English Football League Championship (EFL) and is the founder of the KL Dragons, which is actively involved in the ASEAN Basketball League. In 2016, Datuk Ruben became a co-owner and Board member of the Los Angeles Football Club. Outside his professional engagements, Datuk Ruben is involved with many business- and industry-related groups. He is the Deputy President of Kuala Lumpur Business Club Malaysia, as well as the Board of Trustees of Enactus Malaysia. He is a member of the Governing Body of the World Sports Owners Summit. Additionally, Datuk Ruben is the Vice-President of the Malaysia Basketball Association and a member of the NBA Asia Advisory Board. Besides that, he is also the manager for the Malaysian National Basketball Team.